Medway Council’s Cabinet met on 20th December to discuss proposals for a huge airport in the Thames Estuary. The report to the Cabinet by Robin Cooper, Director of Regeneration, Community and Culture advised Members of the 3 current proposals for International Airports in Medway and Kent and recommends strong opposition to all the proposals. They give 10 good reasons for opposing the plans, and these include environmental destruction, adverse effects on homes, massive new house building covering swathes of the area in buildings, CO2 emission, fog and cost. This report advises Members of the 3 current proposals for International Airports in Medway and Kent and recommends strong opposition to all the proposals. 1. It would adversely affect homes in Medway, Kent and Essex and lead to the demolition of people’s homes. 2. An airport would cause environmental destruction to sites of special scientific interest and internationally important areas where hundreds of thousands of birds migrate to annually. 3. As the Thames Estuary is a hub for hundreds of thousands of birds, there would be a significant risk of bird strike. Even with an aggressive bird hazard management programme, such as shooting or scaring birds away, the bird strike hazard would be up to 12 times higher than at any other major UK airport (source: RSPB). 4. An airport would increase the pressure for additional major development due to the increased attractiveness of the areas of business. This could result in vast swathes of Kent and Medway being lost to development. At least 320 business are directly associated with Heathrow, there are hundreds more supporting the airport and Heathrow employs 72,000 people. If the Thames Estuary airport were to replace Heathrow many of these people would move to Kent and Medway, leading to significant house building and infrastructure requirements. One report suggests a need for up to 83,000 additional houses. 5. 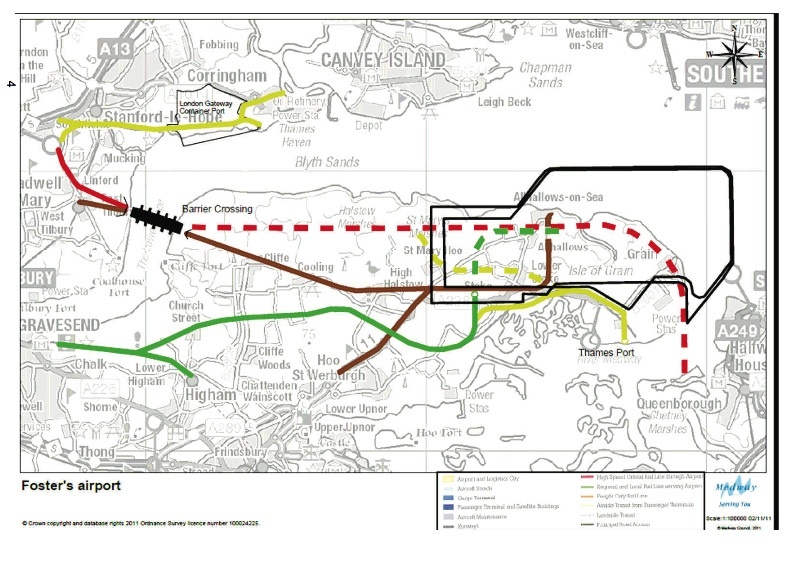 The airport reports do not properly consider the risks associated with operating an airport in close proximity to the existing import facility for liquified natural gas (LNG) at Thamesport and the munitions on board the Montgomery and the proximity of a container port and power stations. Existing airports already have potential to increase capacity. For example, Birmingham says it could double the passengers it carries. Southend and Manston have additional capacity. 6. Better use needs to be made of existing regional airports by improving connectivity. 7. The cost of a new airport would be prohibitive (up to £70 billion). 8. The noise, light and air pollution would be intolerable and exacerbate CO2 emissions. 9. The airport would be fogbound and affected by high winds. 10. Nearly 9 out of 10 international airlines that use Heathrow are against an estuary airport and over 3⁄4 of people polled in the UK. 5.2 Given the concerns regarding the significant impact on the environment and the high risk of bird strikes, it is considered that meaningful proposals for environmental mitigation in line with the requirements of the EU Birds Directive and the EU Habitats Directive would need to be developed prior to the principle of the schemes being considered further.